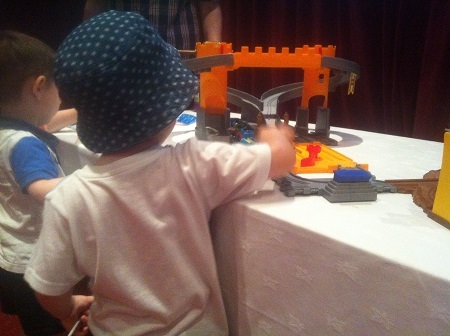 Last week we were invited to a special screening of King of the Railway, the new Thomas and Friends film at Thomasland! This was exciting news for the kids, especially Noah who in recent months has been building up a nice collection of trains from Thomas, he can play with trains (and cars) for hours. At the beginning of the summer we went on a Day Out with Thomas, which the kids both loved so I was sure they would have a great day. In order to make it even more special I booked us a night in a Thomas themed room at Drayton Manor hotel - the kids were blown away. So on the day of the screening we had a nice big breakfast and then hit the park, we were almost the first ones in. It was a beautiful sunny day - in fact I think it might be the last day we can call summer, now this autumn weather has taken hold. The rides weren't open yet, so we took a look at the animals in the zoo area first. 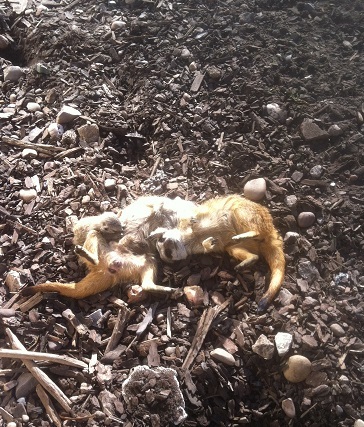 The Meerkats were the clear favourites for my two, particularly as there was a baby one. 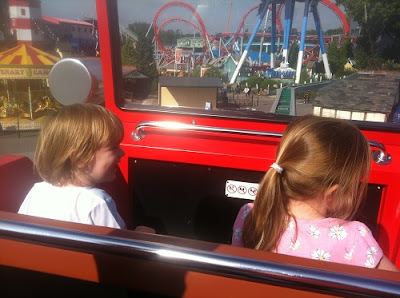 From that point we went on loads of other rides and the kids really enjoyed everything, the only thing they wouldn't try was The Troublesome trucks rollercoaster. 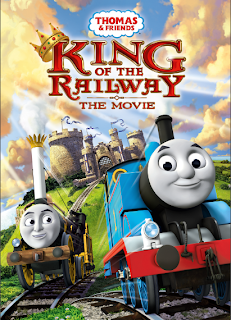 Then at 12pm we made our way to the 4D cinema in the park for the screening of the King of the Railway. 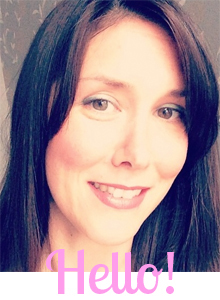 We caught up with a few bloggers that I know and also played with toys from the Thomas range. There were some really great bits, the Mega Bloks Thomas packs looked great and Noah had a good time playing with those, he mentioned Father Christmas afterwards! He's so cheeky! We were also welcomed by The Fat Controller, which was cool. We took our seats in the cinema with our popcorn and drinks and settled down for the film. It was great! And I have to say that was my first experience of a 4D cinema, really good fun was the verdict. Bit of a shock for the kids when the seats made their first move but that was all part of the experience. We had bubbles coming out at us, steam and at one point we got squirted full in the face with water (OH missed out on that as he was on the floor picking up all the grapes Isla had dropped!). The film tells the story of the return of the Earl of Sodor to the Island along with a very old steam train called Stephen. All the trains bustle round and take great interest in Stephen and the exciting surprises that the Earl has in store. When Stephen goes missing, Thomas and his friends look all over Sodor for him and there is a nail biting situation where everyone pulls together to prove how useful they really are. There are some really sweet moments in the film. I liked the relationship between Gordon and Spencer, always vying for the title of fastest train, and racing another all over the island. The way that Stephen is respected by all the younger trains is also lovely. There are also some songs in the film, that Noah really likes. Isla loved the film, she didn't move a muscle from start to finish and being only an hour long, makes it a really great film to show little ones who may not be able to sit through a longer length film. Unfortunately all the running around that Noah did prior to the film meant that he conked out asleep! He saw the first 15 minutes and then it was game over. We rectified this on getting home as the kids got the most fabulous goody bag with a copy of the film on DVD. Noah has watched it loads of times since. After the film we went back out to Thomasland and Noah woke up, a bit upset that he'd missed the film but excited to go back and go on the rides. 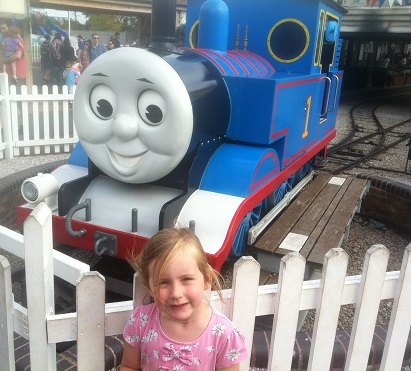 We thoroughly enjoyed our day out to Thomasland and watching King of the Railway. 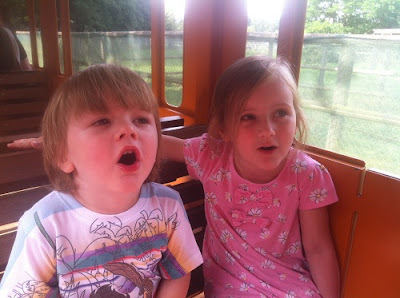 The kids slept all the way home and Isla hasn't stopped talking about the rides she went on that day, including Cranky, who she tells everyone was horrible! Hahahaha. The DVD of King of the Railway will be available from 1st September from all good retailers. I think it would make a great stocking filler for Christmas for Thomas obsessed children! We were invited to Thomasland and to see King of the Railway free of charge. 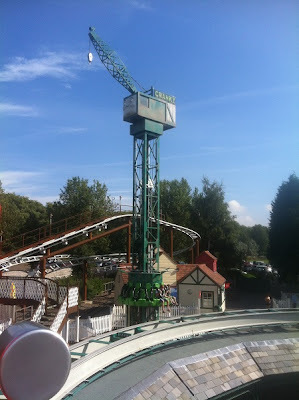 We paid for an overnight stay at Drayton Manor. The children each received a goody bag, filled with Thomas treats!